Open floor plan- View from living room towards the kitchen area. Window with expansive views of village and ski runs. Kitchen with window views to Mountain Village and ski base areas Master suite, vaulted ceilings with french doors to balcony with lots of VIEWS Master en suite bathroom with shower. Master bathroom. Upper level loft with 2 full size beds and separate bath. Second bathroom on main level with shower. Views looking towards the northwest from balcony & road to mtn village entrance. Views to north from balcony. Views looking northeast. View to east and ski runs at Big Sky resort. Views to south with ski runs and Ramcharger lift. View from condo of the base area with ski lifts , ski runs & mountain village. INCREDIBLE VIEWS Ski the peak...Lone Peak at 11,166 elevation Shoshone Condo Hotel: This condo is located on the TOP floor, corner with VIEWS Shoshone exterior view. You are located on top floor on the left side of photo. Sitting area on main entrance to the Shoshone Condo building, lower level. Amazing photo shoot area next to the all knowing bronze bear on lower level. Rustic fireplace, sitting area on lower level of the building nearby health club Outside heated pool. Entrance to outside heated pool area...under the bridge, enjoy Conference room. Penthouse with over 1,300 sf of pure comfort! This spacious, open floor plan, luxury condo offers 2 levels of beautifully appointed living space, that embraces the rustic feel of Montana while located in the heart of Big Sky Resorts' mountain village. 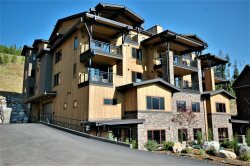 Walking distance to dining, groceries, shops, massage, movie theatre, attractions and amenities that entice your senses while enjoying incredible views, from this 7th floor corner unit, of the majestic rocky mountains and Lone Peak at elevation 11,166’. Over 1,300 sq.ft. of pure comfort! OUTDOOR ENTHUSIAST: This condo is the PERFECT location for your Yellowstone Park and mountain adventures. WINTER activities: This condo is walking distance to some of the biggest and best skiing in America. Over 5500 acres of ski terrain between Big Sky Resort and Moonlight Basin: 24 lifts and 220+ trails. You will enjoy the lack of lift lines (in comparison to other ski areas) and the amazing terrain. Snowmobiling in West Yellowstone and the wildlife adventure is 45 minutes away. During the winter months a shuttle will drop you off within steps from your door. * Master Suite (Main Level): Queen sized bed with plush down duvet, En suite full master bathroom, and a large shower. 42” flat screen TV. * Guest/Loft Area (Upper Level): 2 Queen-sized beds and full pull out sofa bed with full bath, jetted/ bath tub. * Pull-out Sofa Bed (Main Level): Full-sized pull out with full bathroom and shower. 42” flat screen TV. This condo has all the features for the cooking enthusiast. This kitchen has every convenience needed and is fully equipped. Right off the kitchen is a beautiful dining room with seating for six people. * Free Shuttle Service in & around Big Sky and to/from the steps of Big Sky Resort. Amazing Location! View, Location and Amenities were great. Yolanda with Blackstone was pleasant and very accommodating. Reason for not rating 5 stars, but 4.5 - only 1 small dim light in kitchen. We will stay here again when we plan to visit Big Sky. Great location! Our family drove from Jackson, WY to spend two days exploring the Big Sky area. This condo was great for us and our two kids (14 & 10). There is a king bedroom on the main level and two queens and a couch upstairs. It has great views and is located in the middle of the Mountain Village. The market for groceries is a couple of minute walk. Everything was as described and loved that there were simple things available like salt/pepper, coffee and sweetner Etc. The staff I. The building were very helpful and loved the cowboy bellman who never missed opening a door. We spent a lot of time in the heated pool, hot tub, sauna and steam room. I would highly recommend for a summer or winter getaway. Take your Big Sky Trip to the next level! We just spent a week in Big Sky in January. We rented a condo in the Shoshone through Blackstone Property Management. We've stayed at Big Sky before, but this was our first time renting through Blackstone. They provided top-notch service from the minute we contacted them: suggestions on where to eat and things to try (try the sleigh ride, it ROCKS! ), help making reservations, etc. When we showed up to check in, they met us personally, and made sure all our baggage/keys/etc were handled immediately, then escorted us up to the condo and showed us around and made sure we got settled in. Anything we needed, we just gave them a call. The condo was outstanding - great location, beautiful views, full kitchen, three bathrooms, and plenty of room to accommodate even a very large group. Mark and Yolanda know the mountain inside and out, and they really know how to transform a stay at Big Sky from "Wow, that was fun!" to "Holy cow! That was exceptional!" 10 out of 10 - would stay with them again, and would pick them over anyone else. Fantastic Condo. This condo certainly exceeded our expectations. It was our first time to Big Sky, and I can't imagine a better experience. The location was perfect and the views from this penthouse condo were spectacular. The skiing was off the chart great. The hot tub and heated pool were a lot of fun (and seriously hot!). The property management team at Blackstone did a great job and made us feel right at home. We would definately stay here again. Great property, Great View all around! The Shoshone was a beautiful place. The room s was very nice and close to all amenities. I would stay again! Awesome condo in prime location! Top floor Shoshone corner unit w great layout and perfect location. 2 min walk from condo to lift. Had great time w my three teenage sons skiing and hanging in Shoshone health club. Would highly recommend this unit! Taylor Z....Dear Blackstone Staff: I recently brought my fiance and her family to the Shoshone for New Years 2016. The Big Sky Village is truly a skiers paradise and the Shoshone, "Incredible!" I must also tell you the booking process and our entire stay was only possible with the outstanding help of Blackstone Management. Deepest thanks to those two! Really looking forward to staying with your outfit again. Until then, keep it up! Sincerely, Taylor Z. Great location, lots of room, wonderful management! Can't thank Yolanda enough r for meeting us late at night because of weather delays. Great place, would recommend! Great Experience! Good location. A perfect ski in/out property that had everything you needed in room amenities & accommodations! The staff at this company was knowledgeable, very friendly & helpful! We would definitely stay here again and would recommend this stay!